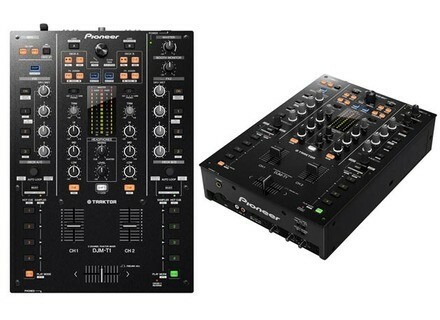 DJM-T1, 2-Channel Mixer from Pioneer in the DJM series. 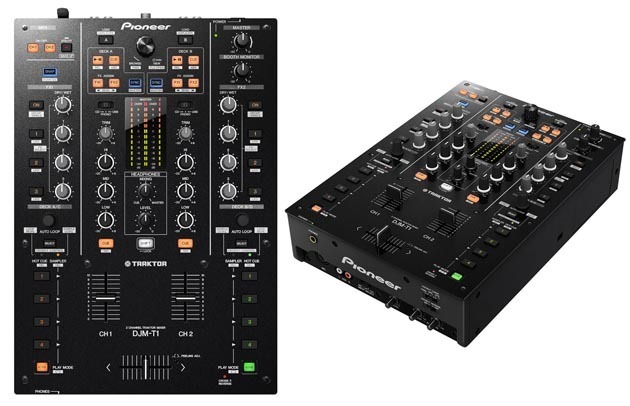 On the heels of the release of TRAKTOR SCRATCH DUO 2, Pioneer introduces the DJM-T1 – the first TRAKTOR certified mixer designed to natively control the software’s new features. The DJM-T1 is a hybrid mixer, a controller and audio interface in one unit. Included in the box is a copy of TRAKTOR SCRATCH DUO 2 software, along with the control CD and vinyl needed for DVS scratch control. The DJM-T1 features controller functions designed for the included TRAKTOR SCRATCH DUO 2 software, so there is no need for an external controller. DJs get access to the 2 new Sample Decks, to create their own loops from live tracks, or remix and edit on the fly. Each Sample Deck gives the option of four loops or samples. Software functions such as browse, fast forward, play and rewind are also operated from the mixer. FX, loops, hot cues and sampling controls on the unit mirror the TRAKTOR 2 interface. It is TRAKTOR SCRATCH certified and equipped with a USB soundcard, so DJs need to use the included CONTROL CD or vinyl to start operating the software’s scratch functions through their CDJs or turntables. 6 of TRAKTOR’s tempo-synched DJ effects (Reverb, Delay, Flanger, Filter, Beatmasher, Gater) and 1 filter per deck are included. Plus the LFO CONTROL signal output changes at beat-by-beat intervals for control. The onboard USB soundcard is designed to eliminate the need for an external soundcard, so DJs can connect the mixer straight to a computer with a single USB cable. The internal soundcard receives input from a PC as a digital signal. The 24-bit D/A converter is designed for not only the master output, but the booth output too. The new channel faders feature 2 metal shafts supporting the fader knobs. The fader is positioned to the side, minimizing damage from liquid or dust that can get inside, according to the company. The DJM-T1 crossfader has a Pioneer magnetic construction, while Pioneer P-LOCK Fader Caps are impossible to pull off in the heat of a mix, Pioneer assures. The operational load, fader curve and cut lag can also be adjusted to your preference. Microphone and AUX terminals located on front of unit. Multi-input selector for switching between CD/PHONO/USB sources. Built-in 3-band isolator type equalizer gives level control ranging from +6dB to -∞dB for HI/MID/LOW ranges individually. The mixer will be showcased at Musikmesse in Frankfurt, 6th to 9th April, and will be available to buy from mid July, RRP €1,499. [Musikmesse] Numark M8 Numark introduces the M8, a four-channel DJ mixer with integrated effects.